This is a nice little read in five parts that tells the story of a young girl trying to protect her dad with the help of her friends. The group reminds me of me and my friends when I was young. You have the muscle, the smart one, the jerk, etc., but we all were friends who would (hopefully) take a bullet for each other. A FUN CRIME CAPER ABOUT CHILDREN! 11 year old Paige and her weirdo friends have a problem: a gang of ex-cons need her dad’s help on a heist… the problem is those ex-cons are morons. If Paige wants to keep her dad out of trouble, she’s going to have to pull off the heist herself. 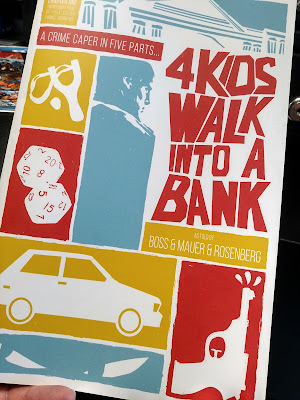 Like Wes Anderson remaking RESERVOIR DOGS, 4KWIAB is a very dark & moderately humorous story about friendship, growing up, d & d, puking, skinheads, grand larceny, & family. As told by TYLER BOSS (Lazarus, Vice.com) &MATTHEW ROSENBERG (We Can Never Go Home, S.H.I.E.L.D. : Quake). I like the artwork which lends to the tone of the story. The story does have some profane language, so is definitely for mature readers. For the most part, I think people will like this if they liked Paper Girls. We still have copies available, so come grab one while they last.